I have always had issues with my weight. I am the middle sister in a family of four siblings and I was always rounder than the others. I realized this early on as my mom dressed my sisters and myself the same. I noticed I didn’t look exactly like they did. My tummy and bums stood out a little bit more than theirs. I also never really found my place with regards to my weight. I was never thin enough to be considered skinny and I was never overweight enough to be considered severely overweight or obese. All that being said I was never really happy with my weight. I have attempted dieting over the years but nothing really worked due to lack of commitment and my love of junk food. I LOVE SUGAR, PLEASE BRING ON THE CARBS and PLEEEAAASE CAN I HAVE AN EXTRA SERVING OF AKHNI. 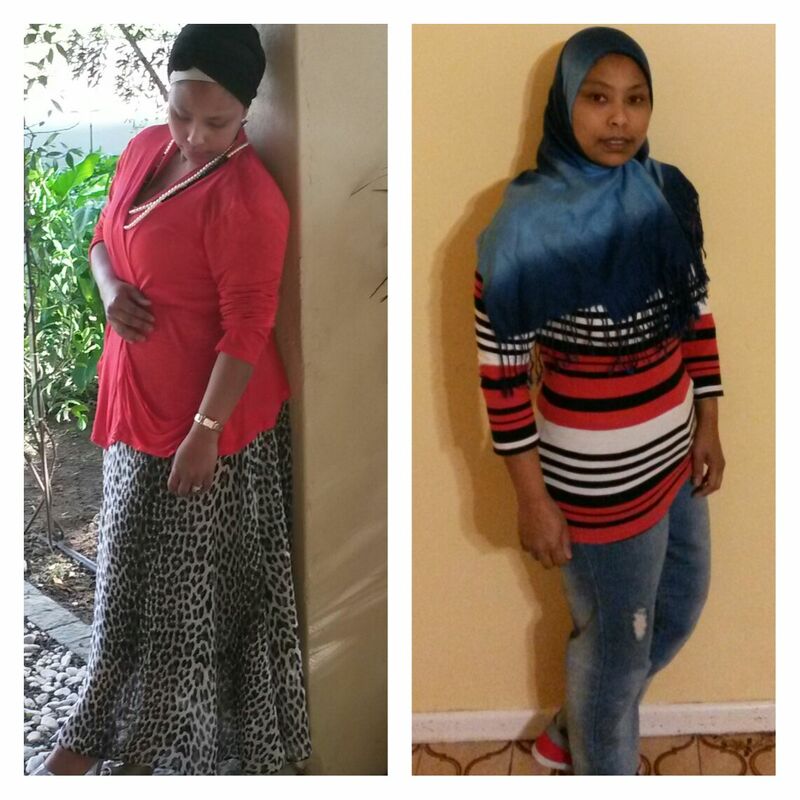 I am a MUSLIM, colored women who grew up on the CAPE FLATS. I can annihilate a FULL HOUSE GATSBY with the best of them and veggies are a side served with Sunday lunch which also includes yellow rice, roast potatoes, roast chicken and whatever cake or pudding my momma decided. Most of my life I have also been sedentary even though I have always had a great love for the outdoors. All of this culminated in my weight reaching the heaviest I have ever been without a bun in the oven in the latter part of 2014. Listen to that voice in your head and heart telling you that you are unhappy with being overweight and unhealthy. Focus on that voice. Zoom in on it and drown out every other voice. People will always have opinions on you, your body, how you look, your weight, what you should and shouldn’t wear or eat. DROWN THEM OUT. The most important voice and opinion are yours. How you feel and what you want is what counts. This journey is about you and it is yours to walk. In October 2014 I started walking. I walked home from work and my goal was to do this at least three times a week. I didn’t belong to a gym, I didn’t have snazzy work out gear and no solid walking shoes but I needed to do something. I bought myself a pair of running shoes for R300.00 and off I went. My first walk home (9k’s to be exact) took me 1h30. I had blisters and two of my toe nails turned blue and later fell off but I kept walking. I didn’t know what else to do but I knew I needed to get my heart rate up. There were weeks I was lazy and demotivated and only walked once. There were weeks I was strong and walked three times a week. As I continued I started watching my time and pace pushing myself and running the uphill sections. I started to enjoy myself. I got into my head; I started to realize I need to look after myself. My body is a gift. If you start exercising even for 15 minutes a day you are impacting your health in a positive way. You become aware of your body, how you have been ill-treating it and how it deserves to be treated. Start small and start slow. Don’t compete and don’t compare. Educate yourself about exercising and listen to your body. It will tell you exactly what it needs. Don’t expect to look like a fitness model. Those people have been at it for years with tailor made work outs and diets. Let them do them, YOU do YOU! I started reading. If all else fails “GOOGLE IT”. I didn’t know much about healthy living or healthy eating and I am still learning. Learn about nutrition. Find out all you can about healthy eating, how to live a healthier lifestyle and look at all the habits you have that contradicts this. Monitor what you eat. Make notes of all the things you eat that keeps you from your goals. You’ll be surprised at how much junk food actually floats around us daily. Start educating yourself on what you should and should not be eating. You know exactly who you are. You know better than anyone what you can and cannot do. By being dishonest with yourself you are only setting yourself up for failure. If you cannot run 5k’s then don’t set that goal and don’t do it. You’re going to struggle, hate it and then just quit. Walk 2k’s and build towards running 5k’s. Rome wasn’t built in one day and living healthy and moving towards your goal weight will never happen overnight. Honesty is key. If you’re not going to be honest about bad eating and no exercise than be prepared to keep the weight on and suffer from poor health. If you’re going to fool yourself into thinking you can exercise at an advanced level when you’re a beginner than get them crutches cos girl you’re in for a world of hurt. Get up and do it. Talking about it won’t help. I had to stop eating wings and cake and chocolate and all my other favorite stuff. I had to stop watching series and put in BILLY BLANKS and work up a sweat. You can only start losing the living healthier and losing weight by taking action. Become active. Change small things. Instead of driving to the shop walk if it’s within walking distance. I no longer take the lifts at work. I always take stairs. Its winter and I no longer walk but I work out a minimum of four times a week. You have to sweat. If you still look good and your hair ain’t messed up after a workout you aint doing it right. Drink as much water as possible. 2L a day is your goal but if you can’t manage try to have at least 1L. The more water you drink the less space you will have for fizzy drinks, juices and other beverages that may be high in sugar. It has so many health benefits. Refined sugar is a no-no. You can’t have all those really nice tasting sweet things and hope for the best. Take out all the time is only helping you to a major cardiac event. Bad eating is only helping you to an early grave. Pack healthy lunches and avoid take out. If you don’t prepare healthy meals to take to work you will end up at a drive through. It’s not worth it. If you can’t give it all up immediately at least cut down. Change your sweets to fruit and change your crisps to nuts. Small changes all add up. Ignore negative nellies. People will laugh at you, mock you and try to bring you down. DON’T QUIT. If you’re having a bad day and you had that whole slab of chocolate, dust yourself off and get right back on the horse. This is an ongoing journey. I have lost 10kg’s and I still have 10kg’s to go. I have eaten what I wasn’t supposed to and eaten more than I was supposed to. The difference is that I didn’t park there. I kept at it. Don’t let a cheat snack become a cheat meal, don’t let a cheat meal become a cheat day and don’t let a cheat day become the norm. Always go back to doing better.